Nielsen Bainbridge Speed Mount White Foam Board 32"x 40"x 3/16"
Speed Mount is a heat activated foam board for dry mounting artwork. 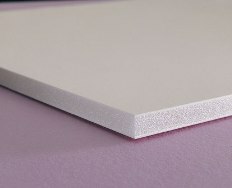 PH neutral, ultra smooth and has a lower recommended temperature than most other heat activated boards (150 - 190 degrees). White with a white core. Sold per carton only.